IMAP is a powerful alternative to POP3. It can be used to do everything that POP3 does, if desired. It allows far more sophisticated and selective retrieval of information than does POP3. It also supports server based searching, public folders, and various other advanced features not posible with POP3. For an application like Gmail Notifier to be able to search the server for unread emails and fetch data, IMAP was the better choice of work. Even more, connectivity to Gmail IMAP server is done over SSL. It is very easy to enable IMAP. Simply go to your Gmail account and click the 'Settings' option on the top. Then go to the tab with the caption 'Forwarding and POP/IMAP'. 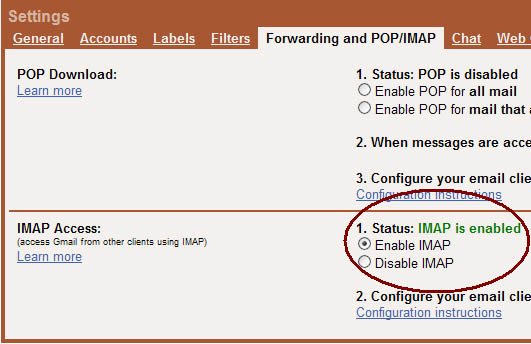 In this window you will have an option to enable IMAP (See figure 1).